Today, Gaijin released their newest devblog, and oh boy is this tank difficult to explain! So, this can probably be blamed on me and my lack of quick response to Gaijin long ago when they asked me to be a consultant for Japanese Tanks and their development. Due to being a busy person I did not have the free time, so they started to work on getting Japanese Ground forces to their players without me, that's only natural. The problem they didn't understand with the I-Go is that the tank has many different models, the naming of which could also be confusing. So without further ado, let's talk about the Type89 I-Go. This is the I-Go Ko 1933. Japan had seen the capabilities of tanks in the military after the First World War erupted. The Great War had illustrated the strategic and tactical transition forced by mechanization and new weapons. These changes frightened the Japanese, who had no major initiatives for armament or organization, and whose doctrine remained unchanged from the Russo-Japanese War, over a decade earlier. Japan decided to purchase a series of tanks from Britain and France in order to initiate their own tank design. With this came a series of Renaults, a Mark.IV Female, and a couple Medium C tanks. 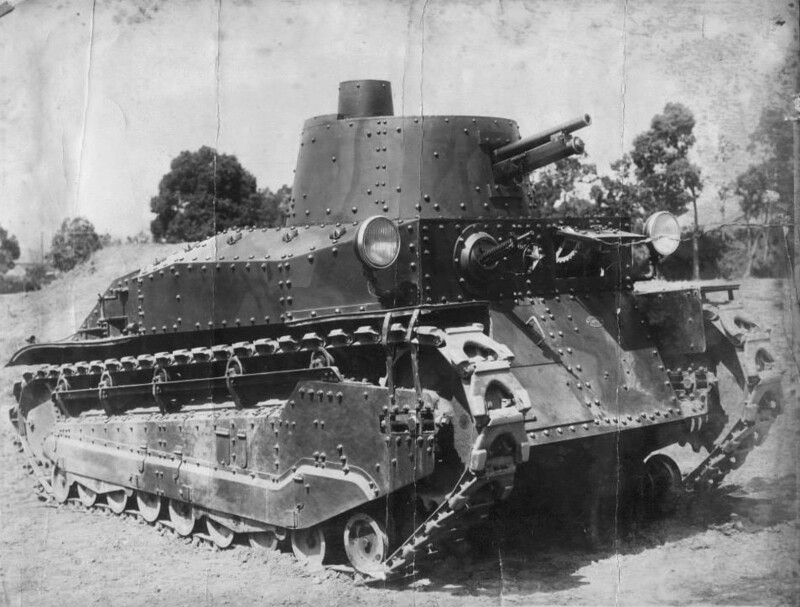 In 1927, Japan had constructed their own tank, the Experimental I. This tank was successful and proved Japan could manufacture their own tanks, but the prototype was too complex with too many parts to replicate. 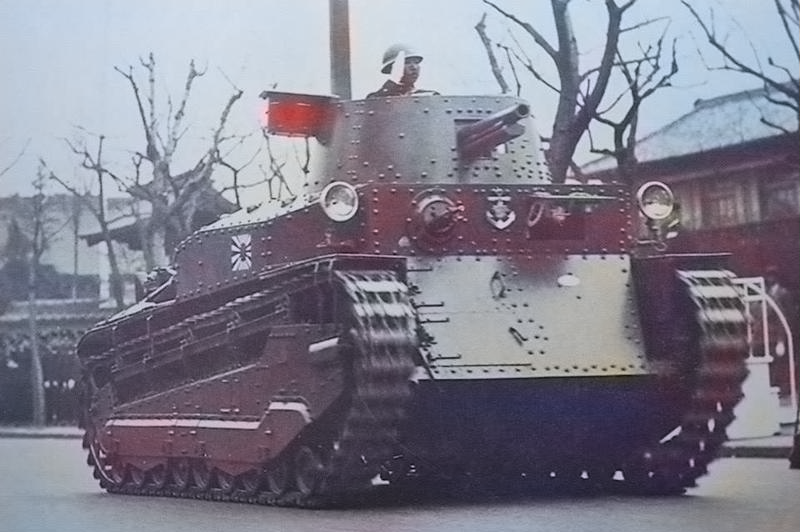 Instead Japan decided to use the British medium designs to make a mass production tank. 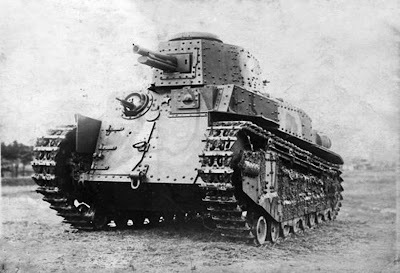 Japanese Vickers Medium C, 1927. 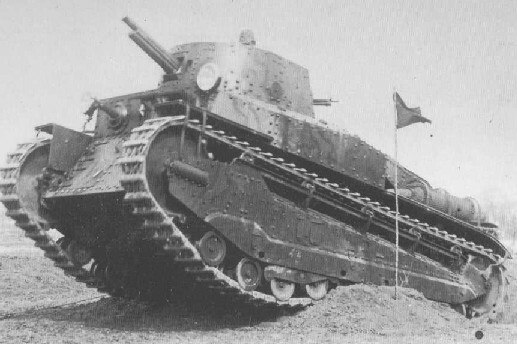 In the March of 1927, Japan had also received 3 Vickers Medium C tanks from Britain for additional influence in designing a mass produced tank. Initially, the tanks were favored upon the Japanese until during one trial when the vehicle maneuvered up a hill the excess gasoline exhaust transitioned into the crew compartment and caused an ignition inside the tank, severely wounded two of the crew. In order to prevent future mishaps like this, Japan decided use safer designs such as the diesel engine for their tanks. This took time, all the way up until 1933 for the diesel engine to be designed for their first produced tank on large scale. After the successful test of the Experimental I tank, the Army developed a sort of boasting confidence that they, too, could produce tanks which could compete with those of other nations. They decided to design two tanks, a light tank of 10 tons, and a heavy of 20. Japan had decided to use tanks to support the infantry in the field, as was commonplace during the period. The light tank was to be produced in large quantities and be able to keep up with the trucks at the time, these would make up the significant force of the tank unit. The heavy tank would be produced in very small numbers and be used as provisional aid in an assault. The 4th Technical Research Group in the March of 1928 began designing a light tank and had finished the initial schematic drawing in August of the same year. In 1929 the 4th Research group send the plans to the Osaka Arsenal, the facility that built the Experimental I prior, and construction finished in April. The tank was labeled Trial Model No.89 Light Tank. 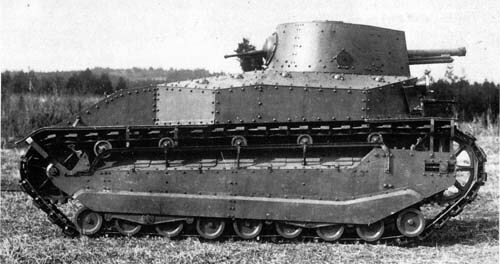 I-Go prototype during trials, 1929. In October of 1929, the prototype went through a trial exercise where it drove from Tokyo to Aomori to see how much the tank could handle under long distance pressure. The tank traveled under its own power for a distance of 660km, and was officially recommended for series production by the staff afterwards. The prototype took influence from the Medium C and its flaws, the tank used a remodeled and simplified version of the C's suspension design, with 4 pairs of roadwheels connected by a set of bogies and semi-elliptical spring placements, a ninth roadwheel placed in front of the forward road wheel in order to achieve superior climbing and trenching capabilities. This was a major improvement over the Vickers C, which was not capable of handling steep inclines and damaged the vehicle as a result. The tank had five return rollers, rear driving sprocket, and a forward idler wheel. The tank used a 6mm cover protecting the suspension system. This was mainly designed to prevent Chinese and Soviet infantry from damaging the complicated and high maintenance suspension in combat. The frontal armour of the prototype was divided, with the upper 1/4 mounted with vertical plating and the lower 3/4 sloped. On the bottom plate in the front, a crew hatch was implemented to the right of the tank where the machine gunner was seated. Prototype as seen in the side profile. The prototype used a licensed built 6 cylinder Daimler water cooled gasoline aircraft engine with an output 100hp, which was located to the right in the rear of the chassis. It was accessed with a small hatch from the crew compartment. It was supported by an 180ah battery to give enough power to start the ignition. Gasoline tanks were placed on the sides on the plate above the suspension, the oil tank being placed left of the engine. In the crew compartment the driver was located left of the tank (looking forward, not at) behind visor port. The MG gunner sat to the right operating a Type3 light machine gun mounted behind the front armour plate. Several ammunition boxes were placed on the right of the bow gunner, adding up to 2800 machine gun cartridges. To the right and left of the tank contained small boxes of rounds for the primary gun, 110 shells. 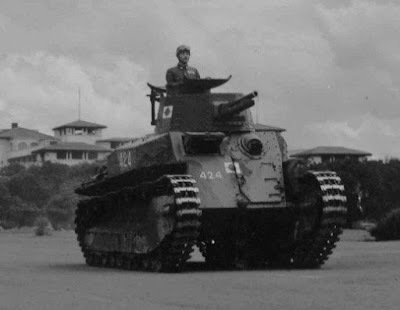 Similar to the design of the Experimental I, the turret was a slight conical shape but had a protruding extension to the drivers side that contained a second Type3 light machine gun, 180 degrees apart. To the left of the MG was the rear turret hatch for tank commander to use when needed. The commander of the tank acted as the primary gunner and loader, while the second turret crew was stationed at the MG at the rear of the turret. The primary gun was a Vickers 57mm due to the Type90 57mm still being developed for the tank series. 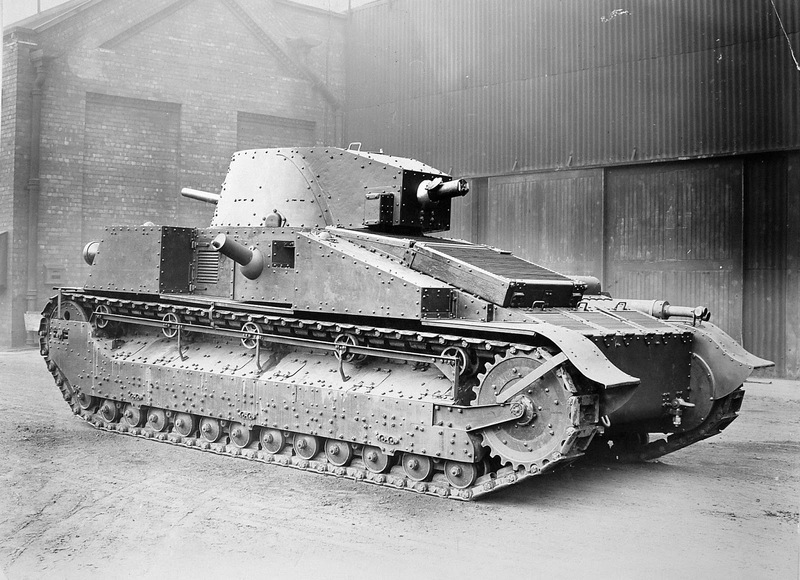 The prototype was accepted and in late 1929 the tank entered service with the military. It was designated the Type89 I-Go medium tank. The tank gun was finished in 1930, however production numbers of the gun were minimal and could not be iterated on the first production tanks completed. As a result, the first I-Go tanks mounted a 37mm Sogekiho Infantry cannon. This model of the tank was very rare. 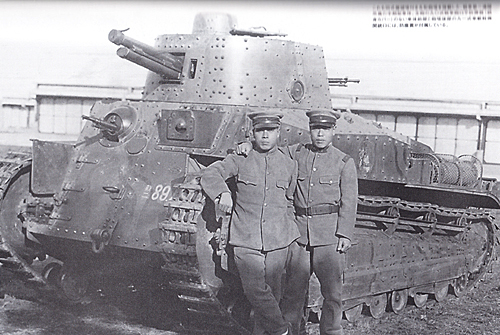 These 37mm I-Go tanks were only produced with 5 units, and only saw combat on February 1932, Shanghai. After the results of the Manchurian Incident, Japan and China had broken out fighting in Shanghai. The I-Go tanks were placed in the 2nd Independent Tank Company, accompanied by 10 Renault tanks. It was here the Japanese knew that their tanks needed tails for trenching and gap crossing due to the nature of the city's layout. This proved to be the first combat scenario the Japanese were met with that had both sides shooting one another, so the crews of these tanks were interviewed after the battle had ended. The tanks performance was satisfactory, but many changes were recommended. The tank did not have a mantlet, this created a noticeable gap when the tank gun when elevated, allowing Chinese infantry to shoot the tank crew. In order to fix this issue the tank was given a small box shield in the next version of the tank. The armour of the initial tanks was divided by a sloped underside and a vertical front. This was met with challenge as Chinese infantry guns that targeted the sloped underside bounced and often hit the center hull, causing disruptions. This too was changed in the Kou model with an all vertical plate. These changes would be made starting in 1933. The first production models were issued with the completion of the Type90 57mm, and production of this series of the vehicle began in 1931. This variant was labeled as the Type89 I-Go Kou. The tank was produced right after the 5 37mm models and formally entered service later that year. The first production model of the I-Go mounted a water cooled gasoline engine, though the front plate was still composed of the same two-part angular lower glacis and flat upper glacis. The I-Go Kou otherwise kept the design of the pre-production model and used a vertical cylindrical observation tower with 4 slits for viewing. Instead of a single turret hatch on the top, the tank was given two hatches, one on the left, and one on the right. The right hatch was under the cupola tower. The tank kept the traditional suspension system of the prototype, however it was changed by removing the track hooks on the pre production model. This was the last model to feature two-part crew hatches in the front of the vehicle. Additionally, the 1932 model of the I-Go Kou would be given shorter track links made of better steel to reduce overall track wear and provide better maneuverability in rough terrain. In 1933, additional improvements were typed into an official second model; rather than retain the flat upper glacis, the I-Go’s frontal armor was reshaped into a single sloped piece, mounted on the front mud guards. This single piece was riveted, and featured additional armor on the front hatches. Starting in 1934, the tank used a new suspension type in order to improve mobility. The drive sprocket was moved forward by 50cm (10in) in order to increase the traction control; the suspension mounting position was lowered by 15 cm, thus raising the hull further off of the ground. The number of upper return rollers was decreased from 5 to 4. The upper track roller support frame was removed, and the upper track wheel was changed to a cantilever style suspension mechanism. This model kept the same engine, but had a new crew placement of the driver on the left, and the MG gunner on the right. The turret was given a rangefinder, and the armor was improved slightly. An additional battery storage compartment was mounted on the upper hull, since the ignition motor had been improved and now required more power. Accordingly, an inspection door was installed on the upper surface of the rear portion of the vehicle body. The exhaust port of the muffler was changed to a cylindrical shape. Third production model (1934) of the I-Go Kou. also mirrored the crew positions. Prior to the late 1934 production models, the driver was located in the right side of the tank (looking from crew perspective), and the Mg gunner was on the left with its own access hatch. With this third iteration of the tank, the crew swapped places. The hatch was located on the right along with the MG position. The driver was moved to the left. The last model of the I-Go was not called Kou. Japanese engineers had originally intended to mount a diesel engine in the original prototype for safety purposes and easier field maintenance. However, Japan had neither the experience or tools necessary to produce such engines when the original model was fielded. Only in 1935 were the first diesel engines completed and ready for use in the Type89 I-Go. 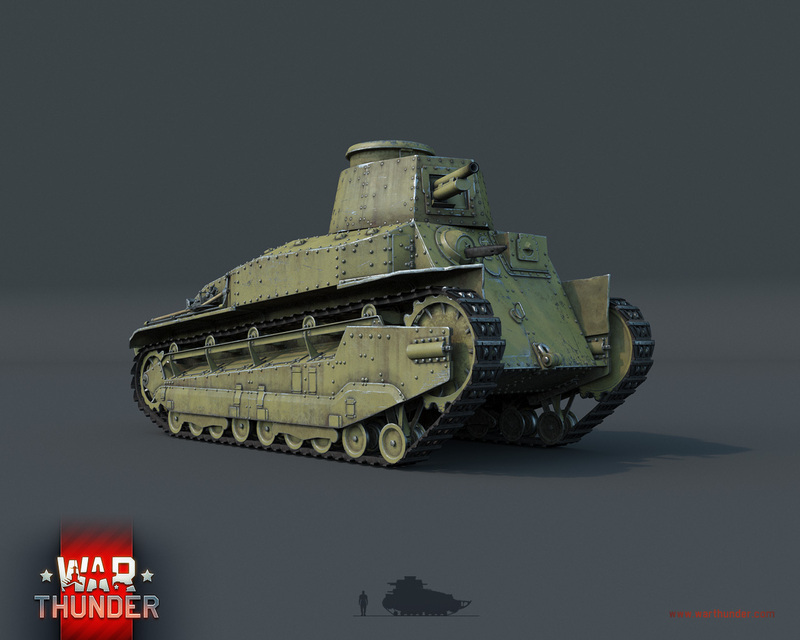 The tank remained almost identical to the late 1934 model Kou, With this new engine, the radiator that had taken up the left side of the engine compartment became unnecessary. As such, the fuel tanks which were once mounted on the left and right sides of the hull were moved into the space vacated by the radiator. Production of this model began in 1934, but it did not enter serial production until 1935. To free up additional space, the battery and oil containers that were in the engine room on both sides of the tank were transitioned to the sides of the vehicle. Fuel replenishment pallets were installed on the right upper surface of the tank. One lubricating oil supply pallet was installed on the upper rear of the tank. The armor grill over the radiator was changed to a hinged design which opened to the left. This gave access to a siccoro fan which pulled air through a pipe and into the diesel engine itself. The battery inspection door in the center of the rear slope of the tank chassis was also enlarged. Since the vehicle no longer used an aircraft engine the water-tank lid and the lubricant supply lid for the radiator, which were located on the upper surface of the rear part of the tank, were removed. Also removed were the carburetor and its service hatch, while the muffler was changed to a triangular design. Believe it or not, but this is only going over the official production models. The I-Go underwent many, many field modifications. Keep in mind two tanks may be the same model yet have small differences. This is because two corporations took part in producing the I-Go, Mitsubishi Heavy Industries and Tokyo Manufacturing Plant. Both were new factories, both had their own unique appearance of the I-Go Kou tanks. Besides this, there were other variants down the line. This is why the tank is very, very complex. One major type of tank that I see a huge lack of info on is the spaa's plan any article on them? Or are you waiting for a possible Japanese spaa devblog? Can I get some more information on the 37mm sogekiho? It seems to have also equipped the Japanese Renault FT and NC (or maybe just one of them? ), but what was the gun actually like? What was its muzzle velocity, ammunition types, year of introduction etc.? Hope you can fill me in. what is behind the gun, a long 57mm?